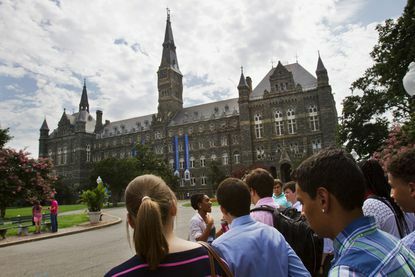 Students at Georgetown University students have approved a referendum to add a reparation fee to their tuition that will go to descendants of slaves the school sold almost 200 years ago. As a result of the resolution, students will now be charged an additional $27.20 per semester. More than 2,500 undergraduate students at the Washington D.C. campus voted in favor on Thursday for the "Reconciliation Contribution" fee. CNN notes that the collected fees would amount to about $400,000 annually and, per the bill, would "be allocated for charitable purposes directly benefiting the descendants. and other persons once enslaved by the Maryland Jesuits". The fee, if passed by the school's board of directors, would benefit the descendants of the 272 enslaved people sold by a Jesuit society affiliated with Georgetown in 1838, known as GU272. University administrator Todd Olson didn't commit to the fund's establishment in a statement on Friday, but said the non-binding vote provided "valuable insight into student perspectives".